R-L: Executive Director, Operations, Nigerian Maritime Administration and Safety Agency (NIMASA), Engr. 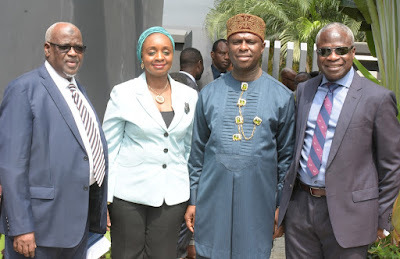 Rotimi Fashakin, FNSE, Director General, NIMASA, Dr. Dakuku Peterside, Head, Legal Services, NIMASA, Mrs. Aisha Jidda, and Executive Director, Maritime Labour & Cabotage Services, NIMASA, Mr. Gambo Ahmed during 8th Strategic Admiralty Law Seminar for Judges organised by NIMASA in conjunction with NIALS in Lagos. The DG who spoke in Lagos during the 8th Strategic Admiralty Law Seminar for Judges organized by NIMASA in conjunction with Nigerian Institute of Advanced Legal Studies (NIALS), also explained that the non-implementation and enforcement of the conventions has been affecting investments in the country. He said that so far 19 of the conventions have been domesticated by way of regulation, adoption or incorporation under the Merchant Shipping Act of 2007. “It has been a herculean task trying to sell Nigeria to the international community for investments, because in some cases the investors had raised the issue of uncertainty in dispensation of litigation and implementations of laws. It is on the premise that the seminar titled Strengthening Nigeria’s Admiralty Regime through Effective Implementation of International Maritime and Labour Instruments was imperative,” the DG said. Speaking further, he stated that the Agency is working closely with the Federal Ministry of Transportation under the auspices of an Inter-Ministerial Committee to ratify an additional six IMO conventions before the end of 2019 to ensure that Nigeria as an IMO member state fulfills its treaty obligation. These conventions are; The Hong Kong International Convention for safe and environmentally sound recycling of ships 2009; Protocol Relating to Intervention on the high seas in cases of oil pollution casualties (Intervention Protocol) 1973; 1996 Protocol on limitation of liability for maritime claims (LLMC).